These smoked gammon and spinach potato cakes make a tasty, comforting and healthy supper dish, served with a juicy tomato and red onion salad. Place the potatoes in a saucepan and cover with cold water. Bring to the boil and simmer for 15-20 minutes until tender. Meanwhile, wilt the spinach in a colander by pouring boiling water over it, or cook in its bag in the microwave according to pack instructions. Drain the potatoes, mash with the crème fraîche and season well. Stir through the chopped chives and gammon. Using your hands, squeeze any excess liquid from the spinach and chop roughly. Stir into the potato mixture. Shape the mixture into 4 large, round cakes. Over a medium heat, gently fry the cakes in a non-stick frying pan without any oil until they are golden and crusty; about 4-5 minutes each side. Remove the cakes and keep warm. Pour boiling water into the pan and return to the boil. Reduce the heat to a very gentle simmer, carefully crack 2 eggs at a time into the water and poach gently until the whites are cooked through. Remove from the pan with a slotted spoon and drain well on kitchen paper. 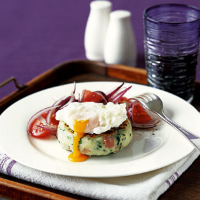 Divide the potato cakes between 4 plates and top each with a poached egg. Serve with a tomato and red onion salad. Instead of spinach, you could use any seasonal wilted greens, such as cabbage or baby leaf greens. This is a good dish for using up leftover gammon.